The strategic worldmap in Battle Brothers is filled with opportunities for adventure, battles and interaction. One of these opportunities are locations that you can explore, destroy and plunder or trade with. In this week’s developer’s blog we want to present you a couple of these locations. Before getting into the midst of things a quick word on how locations work. Each location has its own resources that it uses to “buy” various parties with that each have their own agenda, AI, combat strength and troop composition. These parties will then venture out to perform various tasks. Most of these activities have the ultimate goal of increasing the location’s resources so that it can buy even stronger parties in the future. 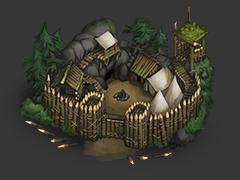 The hideout is an encampment hidden in rough terrain like dark woods or steep hills in a safe distance from the next stronghold or watchtower. 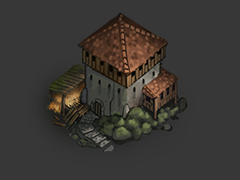 The hideout usually harbors a flock of bandits or other scoundrels that use it as a base of operations to plunder trade routes or raid unprotected villages. It will first send out several small groups of scouts that search the area for valuable targets like trade caravans or small villages that do not have a lot of defenses. Once they have observed and estimated a target they return to the hideout to inform their fellow bandits. The hideout then uses its resources to create a larger raiding party that travels out to attack the reported target. If the attack is successfull, the bandits plunder everything they can get their hands on and haul it back to the hideout, in turn increasing the hideout’s resources. If the player, or any other faction for that matter, manages to intercept the scouts before they get back to deliver their information, the hideout won’t be able send out raiding parties as they don’t know where to send them. 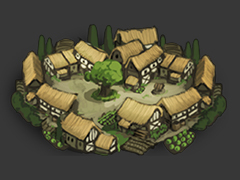 If the hideout’s activities go unchecked for a while, their raiding parties will grow with their available resources and their parties become bigger and bigger until then can evenetually even threaten larger towns or watchtowers. Watchtowers are used to guard the long and lonesome roads that trade caravans use to get their wares from one market to the next. As these trade caravans are easy prey for bandits and worse, the watchtowers aim to prevent any attacks on them. These towers are usually placed along the road network and mostly close to road intersections. They use their resources to create patrols that move along the roads up to the next market and scout for bandits and their hideouts. The resources are not gathered by the tower itself, but the tower is usually supplied by the much bigger strongholds that are described below. The patrols will of course hunt down any evil-doers that they come by but in case they are not strong enough to deal with the threat, the watchtower will be able to spawn a bigger assault party and even call in help from a stronghold that houses a lot more troops. The stronghold is a big military fortress that accomodates a large amount of professional soldiers and provides security to a large region. 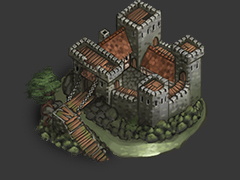 The stronghold will create patrols of its own like a watchtower but it will also supply the much smaller watchtowers in the vicinity via supply trecks. Of course these supply trecks can be raided just like trade caravans. What is more, the stronghold does have the means to fight bigger threats by sending out a dedicated assault party of trained footmen and knights. However, the soldiers of the stronghold are not numerous enough to guard any caravan or village at all times. So there will be many opportunities for the player to help out civilians in distress even when close to a stronghold. As a stronghold usually has a smithy dedicated to forging and repairing all kinds of weapons and armor, the player will have the opportunity to stack up on military equipment. The amount and grade of equipment will be different for each stronghold depending on its location and resource stockpile. We already talked a little about the human settlements in previous blog posts. These play a central role as in the strategy part of the game as you need them to hire new men, buy equipment and do much more. These settlements create trade caravans with local goods and send them to other towns markets to generate trade revenue for both locations. Because these caravans are usually not very well guarded, bandits will try hard to ambush and plunder them. If the bandits, or any other attacking faction, attempt to attack a settlement itself, it will hastily gather a militia troop to fend of the aggressors. However, this needs some time and if the attackers are fast enough or are seen too late, for example by attacking at night, the settlement will be completely undefended. The strength of the militia depends on the resources available. This project is really coming along. Looking good! Two questions about the strategic map. First, I love the fact that the world is simulated. That you are only one of several with an agenda. I’m wondering, it is real time on the map right? And if so will that have performance problems, cpu-wise you think? And one more thing. If you don’t do anything yourself, will the friendly computer try to get rid of skellie-hideouts and so on by itself, or is that just for you? Concering your question with the hideouts (=spawnpoints). There are certain locations capable of spawning aggressive parties to destroy other spawnpoints. These parties are called “assault parties” internally and can be spawned by a human stronghold for example. Of course the stronghold would first have to find out where exactly the enemy hideout is located before it will spawn such a party and needs to have the required ressources available to span such a powerful party. Looks like it could be a real hit. Just hope you get more attention because you guys deserve it. And thanks for the answers. Cool stuff all around, squashing bandits is always fun. I need to keep an eye on this game as it is something I wished for not even a month ago (a medieval style xcom thingy without the high fantasy magic/elves/ect. stuff). Thanks man, great to hear that! We are always happy to hear that our ideas are appreciated. There is a lot more cool stuff to come so stay tuned for the upcoming weekly updates! I was linked to this game today on a forum and after checking your site have been quite happy with what I’ve seen. Big fan of the games you cited as influence and I love the gritty art style, authentic Viking and Germanic names on the Brothers, the depth of weapon selection and pretty much everything else. Oh and the skeleton enemies look adorably vicious – I have a soft spot for old school skellys. You guys sound really ambitious with this update post! Best of luck and I hope you get to make exactly the game you want. First off this GAME! its literally the game I’ve been dreaming of lately. I’m so glad I stumbled upon this by chance. Are we likely to see ‘good’ tolkien inspired races (such as Elves, Dwarfs, Halflings). The Witcher series has shown that these races can work in a Medieval fantasy setting. Glad to see you found your way here! We won’t have the traditional fantasy races of Elves, Dwarfs or Halflings in the game. Generally, we want to keep things down to low power fantasy and promote a certain asymmetry between the player and the opponents in the game; Battle Brothers will always be common humans in a pseudo-medieval setting that sometimes have to go up against non-human and supernatural foes. Foes which possess powers the player doesn’t have access to, which makes them feel that much more alien. It is for this reason also that we try to avoid skills for the player that feel clearly unrealistic and superpowery (e.g. shooting 3 arrows at once) to keep things grounded a bit. That said, we may add different human cultures (e.g. a middle-eastern oriented one) from which to recruit your men in the future. These cultures would also include their own historically-inspired armory. I like that idea a lot. That being said, Elves, Dwarves and Halflings can exist in a non-magical form. In the Witcher series, they are almost totally non-magical. Existing as alternate races with their own cultures, rather than supernatural beings.